On July 13th, we celebrated Muffin and Squeaker’s fifth birthday by throwing them a party in a local park. 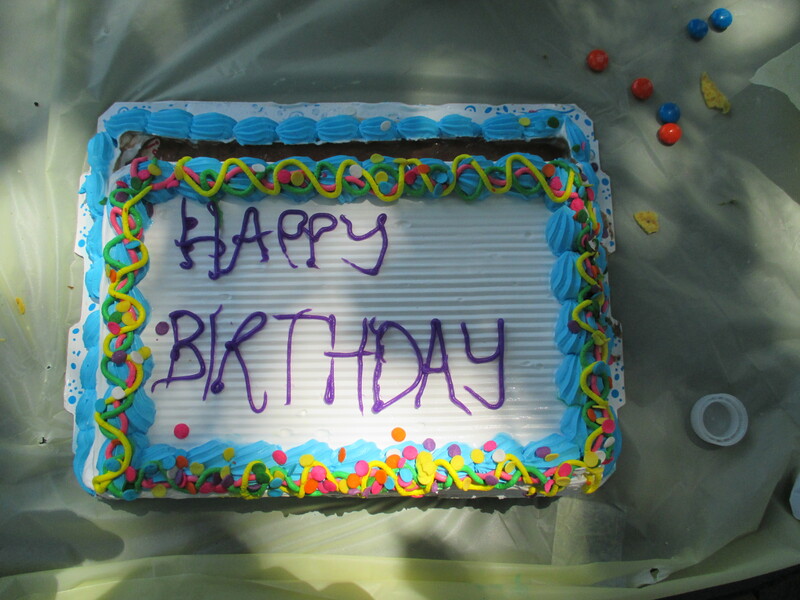 We’ve done park parties every year since they were two years old; this is one of the advantages of summer birthdays. (As someone who has a January birthday, I had to have not only a party date but a party snow date in case of blizzards.) Last year, we had the party at the Waldstein Playground in Brookline, but as Waldstein is undergoing reconstruction, this year’s party was held in a park just over the line in Brighton, near the preschool that the girls recently graduated from. Birthday party planning got underway almost as soon as we had chosen a date. One of the nice things about holding birthday parties in the park is that the activities are already provided by the existence of park equipment. This year, however, Michael thought it might be a nice idea to add Circus Dynamics to the girls’ party to provide balloon animals and face painting. He got in contact with the performers, and a plan was set. Meanwhile, the details of food and goodie bags and the like were my responsibility. And all would have been simple and straightforward, had I not gotten sick. But my extended stay on bed rest wreaked havoc with the purchasing of items for the party, so all I could do was make lists of the items I needed to acquire. I was released from bed rest with less than a week to go. Along with my reentry into the world was my return to work, and I was under orders from my doctor to work half-days so that I could continue my recovery. In the end, I found myself with very little time to do any errands or other physical preparation for the party. So by the time I was out and about, I had a plan. Friday morning before work I went down to the Dollar Tree in Brighton and purchased the majority of the paper goods and decorations for the party as well as the items for the goodie bags to be given out at the party. On Saturday night, I baked two cakes (a chocolate cake for Squeaker and a spice cake for Muffin) so that they would be cooled in time to be decorated at the park. (I learned the hard way not to attempt to transport an already frosted cake to a park party. It’s easier to frost than to re-frost). And on Sunday, I did the last of the errands for purchasing the food – including the Burstein-traditional Carvel ice cream cake – for the party and the cake decorations. However, on Saturday night, Muffin was still giving me cake decorating instructions. I told her that the decision had to have been made weeks before, and she was virtually inconsolable, sobbing at the thought that she could not have the cake design that she wanted. Finally, she decided on a dinosaur-themed cake, and that I could do on almost no notice. 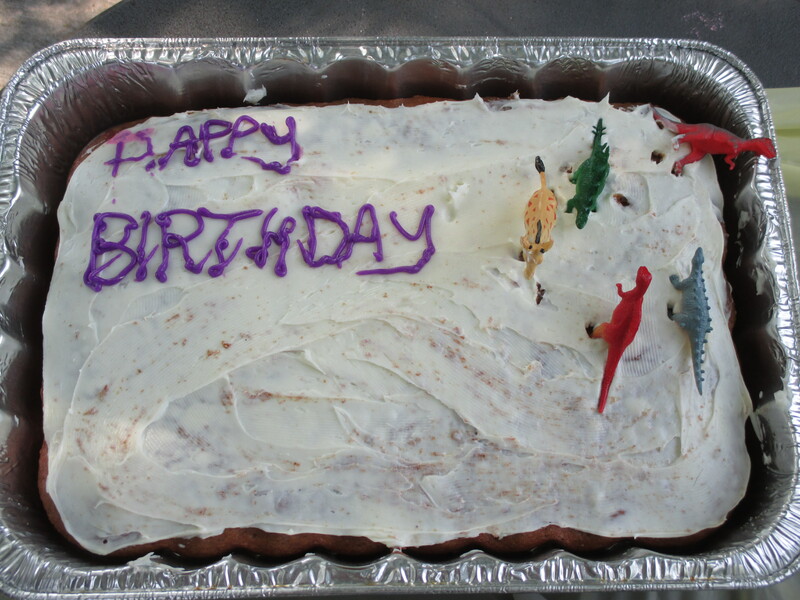 As I ran the last few errands on Sunday morning, I stopped and picked up some plastic dinosaur figurines to be put on the cake. And when it came time to decorate the cakes, I gave the figurines to the girls and let them arrange them. So the theme became “dinosaurs, balloon sculptures, and face painting.” Everyone ended up happy, and we had a party with no meltdowns. In fact, the party was a huge success. The folks from Circus Dynamics were wonderful and kept the kids wildly entertained. The food, while simple bagels and snacks, was consumed with great gusto. The weather was better than we could have hoped for given the prediction of possible thunderstorms. Friends from a number of the girls’ social circles, including some of their Kindergarten classmates-to-be, came to celebrate with the girls, and both parents and kids told us they had a good time. I usually try to end my columns with a final thought, and since this column is running the day before the girls’ actual birthday, I’ll end with a thought for them: Happy birthday, our darling girls. Mommy and Daddy love you! This entry was posted in Columns and tagged birthdays, Brookline parks, cake, childrens birthdays, dinosaurs, parks, rituals, twins birthdays. Bookmark the permalink.